It's a tough game with odds as tricky as 1-in-176 million for the big prize. 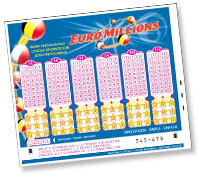 But EuroMillions also offers some of the worlds largest jackpots, reaching an eye watering €190 Million. And it's this combination of tough odds and jumbo prizes that make it a perfect game for playing in a syndicate group. You Play We Play Small professional company who also play UK Lotto and Thunderball too. 'Pay as you go play' from just £2.00 per draw. 'Play Lottery' Review 10 years of experience managing syndicate groups for UK Lotto, EuroMillions and Spanish Superdraws. From £5 per week. Love My Lotto Syndicate 'Multi-lottery' specialist also covering UK Lotto, Daily Draw and more. Starts at just £12 per month. Lotto By Text Play the lottery by text from your mobile phone. But terrible value for money. When Did It Start & When Was The First Draw? The UK joined forces initially with France and Spain to launch a lottery destined to produce some of the largest jackpots in the world. The launch took place in London on 5 February 2004. It launched quickly after final approval from officials, and the first draw took place on Friday 13 February 2004. Weekly draws are made in Paris every Friday. A second draw was added on Tuesday from 10th May 2011. What Countries Are In The EuroMillions? Since the UK, France and Spain launched the game, they have been joined by Belgium, Luxembourg, Switzerland, Portugal, Ireland and Austria. And more European countries are expected to join as this very popular game continues to gain a stronger foothold throughout Europe. Which can only lead to jackpots that get even bigger. Camelot, who run the UK National Lottery, has said that "approximately 50% of the sales will go towards prizes, with approximately 12.5% of sales funding the top tier prize level". There are 13 prize tiers (detailed below) in total with typical jackpots expected to be in the region of £14 million each draw. The draw itself is a combination draw involving 5 balls drawn from 50, plus a further 2 balls drawn from 11 (these are termed 'Lucky Stars'). This was changed from 9 Lucky Star balls in May 2011. All 5 of the main balls plus the 2 lucky stars must be matched to claim the jackpot - giving a 1 in 116 million chance of winning, as opposed to 1 in 14 million for the UK Lotto draw (a more typical '6 from 49' game). So the odds are pretty tough, but this does of course result in more rollovers, with rollover jackpots often reaching up to €100 Million. Which of course then attracts even greater spikes in ticket sales, sending jackpots surging to new record highs. And it's this combination of big jackpots but tough odds that has created a surge in the number of online EuroMillions syndicates. Tickets cost £2 in the UK (which includes the add-on game 'Millionaire Raffle'), and €2 in France and Spain. How Can You Buy Tickets Online? We are often asked about where you can get tickets if you don't live in a participating country - well here's our guide on how to buy EuroMillions tickets online. What Is The Latest Time To Buy A EuroMillions Ticket? The cutoff time for buying tickets is officially 7:30pm (GMT) on Tuesday and Friday, i.e. the days of the actual draws. But you'd be wise not to wait until the last minute, particularly when big rollover draws are taking place. You also need to bear in mind if you want to play with a syndicate, or use an online ticket service that the cutoff time will be much earlier. To allow time for those services to buy tickets. The minimum match required to win something therefore is to Match 2 main balls. But note that you do also win a prize for matching both Lucky Stars plus just 1 main ball (so don't throw your ticket away before checking your Lucky Stars!). The larger number of smaller prize tiers provides for an overall chance of a prize of 1 in 13. The Match 2 prize level was added when the new Tuesday draw was introduced, which improved this from 1 in 24. For details about the latest changes to the game, head to: EuroMillions Changes. 13 Jul 2016 Lucky stars to be increased from 11 to 12 from September. 29 Jan 2016 Finally a jumbo jackpot gets shared. €132,376,632 split between Ireland and France. 20 Nov 2015 It's Portugal again - they must really love EuroMillions - this time for €163,553,041. 12 Jun 2015 A UK winner who wisely chooses to stay anonymous picks up a win for £93,388,943. 06 Mar 2015 Another anonymous winner from Portugal - this time for €100M. 24 Oct 2014 An anonymous Portuguese winner claims a capped €190M win. 03 Oct 2014 The Superdraw is back with another guaranteed €100M jackpot. 12 Jun 2014 First ever postponed Superdraw. The jackpot beat out the guaranteed €100 Million prize. 13 Nov 2013 It's Mega Draw time again, and the last one for 2013. Jackpot of €100 Million to be won. 16 Mar 2013 Here comes another Mega Draw. The Friday 22nd March draw is a guaranteed €100 Million jackpot. Don't miss it! 27 Dec 2012 (UK) Yikes - another 25 x £1M Millionaires Raffle prizes for the New Years Day draw. 14 Dec 2012 (UK) 25 x £1M bonus Millionaires Raffle prizes for the Christmas Day draw. 15 Aug 2012 Big win for the Bayfords with a jumbo pot of over £148 Million going to just one winning ticket. 9 Aug 2012 Maxed out again at €190 Million, another important roll down draw with a guaranteed payout. 27 Jul 2012 A very special Olympics draw to celebrate London 2012, with an amazing bonus 100 x £1 Million prizes awarded in the UK. 17 Feb 2012 Another Important Rule Change - a very important change that means the new Jackpot Cap allows the whole jackpot to roll down to the next prize level. 18 Jul 2011 Scottish Winners: The Weirs - the UK's largest ever winners claim an incredible £161 Million, making them richer than the Beckhams! 25 Mar 2011 The Tuesday Draw is announced - an extra draw per week, but with some unpleasant news about making the game harder to win tucked in with it. 10 Oct 2009 The UK adds Millionaire Raffle, but increases ticket price. How Do I Play EuroMillions? - here's a quick guide to how to buy a ticket and fill in your playslip. It's pretty easy though. How Does The Roll Down Rule Work Now? - starting from the draw on Friday 17th February 2012 the Jackpot Cap rule has changed. So it's now possible for the whole jackpot amount to roll down. What Are The Chances Of Winning The EuroMillions? - find our more about your odds of hitting that jackpot. There are thirteen categories of EuroMillions prizes, including the jackpot. Each category is dependent on how many of your numbers match those that have been drawn for the week, with fewer numbers winning smaller prizes. If there is no jackpot winner, the amount rolls over to the next week. 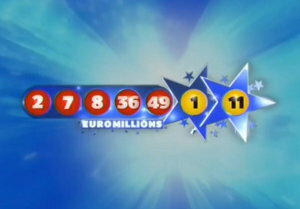 And keeps rolling over until someone wins the jackpot - or it hits €190M when the roll down rule is applied. Prizes are distributed between all winners. That means, regardless of the amount of the jackpot, if there are multiple winners, they must split the winnings evenly. One jackpot, for €96.5 Million, was won by 16 people. They each received €6.4 million. This may not be the full jackpot but people are not usually too concerned with that considering the amount they get. The largest of the EuroMillions prizes ever awarded until recently was claimed by a woman in Ireland. Dolores McNamara won an eleven week rollover jackpot valued at €115,436,126. She took home her prize making her the 72nd richest person in Ireland. Her ticket was bought about a half mile from her home, using the quick pick method where the machine picks random numbers for you. For Dolores and her family, the sudden fortune has not been as wondrous as you would think. Soon after she won, death threats and kidnapping attempts started coming at her and her children, forcing them out of their homes and into hiding. She eventually moved into a much larger house, and had a state of the art security system installed. Remember to decline the publicity option when you win! 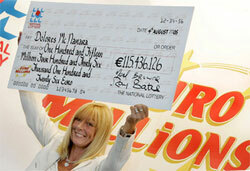 In May of 2009, Dolores' record was broken when a woman from Spain won a jackpot totaling €126M. At 25 years old, she will now never have to worry about money again. The woman bought her ticket online, and then became ill. She did not find out she had won until she went to work Monday to avoid losing her job. Although still sick, she was struggling through her day in order to keep her job in a tough economy when she got a call from the online dealer that had sold her the ticket. As of May 14th she had not yet collected her winnings, but she will soon be on the list of lucky people who have changed their lives for the price of a cup of coffee. EuroMillions is changing lives all over the world. And while the chances of winning the big money are normally very small - 1 in 116,531,800 - there are many other prizes, and you can join a EuroMillions syndicate to boost your chances of winning. Or if you specifically want to buy tickets here's a guide to buying them online. Because the EuroMillions game is shared across multiple countries, it doesn't really have a single official home online. Each country that participates features the game on their main official lottery site, e.g. France has a page dedicated to the game here and Ireland has it's own page here. VWD (Virtual World Direct) A professional syndicate, from a very experienced organiser with an odd name. Tips 4 Winning Low cost semi-pro group. Play for just £3.50 per week. 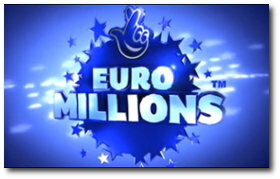 Euro Millions Oracle Low costs but small group sizes hurt chances of winning. 'PlayLotto' This one is actually a German lottery pool. Poor value for money though, and worrying signs. One to avoid.